Twas the eve of December 8th In 2016, Tech in Motion DC was seated, Timmys winners not yet seen. The campaigns were all done, and the votes were all tallied. The races were tight, following a few last-minute rallies. Before the winners could be announced, SHAWN DUBRAVAC took the stage to read them a poem and leave them amazed. Half cultural zeitgeist, Half yearly retrospective, with only a mic in hand, some favorite moments were selected. From 2016 and the year after too. With permission granted, we’re sharing it with you. they had to remove the old headphone jack? Well there you all have it, from all of us on the Tech in Motion team. Happy holidays to all, we’re excited to ring in 2017. Ring in 2017 with Tech in Motion in your city. Find an event to attend here. DEMO COMPANY SPOTLIGHT: ThinkFun, Inc.
ThinkFun, Inc., originally known as Binary Arts, is an Alexandria, Virginia-based educational toy company. Founded in 1985 by Bill Ritchie and Andrea Barthello, the company has since been featured in the New York Times, TechCrunch, and Wired, while also winning many awards for their games. The company is on a mission to “Teach Through Play” and neither borders nor language barriers will stop them: their games are sold in over 60 countries and have been translated to over 20 different languages. See demos from awesome companies by clicking here and joining your local Tech in Motion branch. With a catalog of over 70 games throughout its history, ThinkFun, Inc. continues to innovate and remain relevant. 2014 saw the company release the game Robot Turtles (one of the most backed board games in Kickstarter History) followed by 2015’s Code Master, with both games sharing the intent of teaching children the logic and problem-solving mentalities needed to be successful at coding. Looking for work in coding? Apply here. For 2016, the company is making its rounds to toy fairs and gaming conventions alike in promotion of their newest game, Escape the Room, a logic-puzzler that is based on the internet and real life sensation. If you want to meet ThinkFun, Inc., up close and personal, you can find them on February 25th at Tech in Motion DC’s Demos: EdTech Edition. Otherwise, you can learn more about them on their website. Want to launch an app? Buckle up, it can be a wild ride! This fall, Tech in Motion: Toronto hosted Food + Fitness Demos & Drinks, packing coworking space Acme Works with more than 100 local enthusiasts for a night of networking, drinks and demos from 8 food and fitness app companies that are revolutionizing the wellness industry. Check out some of the latest products and ideas from these hot companies: Gymnut, MealSurfers, Baron Biosystems, Ritual, MenuSnap, Trainer+, MizPiz, and Carrot Pass. Join a Tech in Motion chapter nearby to attend events like this in the future. Smartphones have taken over the world. Almost anywhere you go you’ll see people with their eyes locked deep into the warm glow of the screen on their hand. The modern day gold rushers have long envied the ability of this relatively new technology to capture people’s attention. The business potential is almost unlimited. Perhaps the best part is that it gives developers an almost unlimited playground to bring their idea to life. It seems like life will be a bed of roses until some of the realities of creating an app show up. The first question to ask is: What is the specific goal that you are trying to accomplish? Are you looking to boost sales for your company? Create a new way for people to connect? New games or other forms of entertainment? Once you have an answer to that, research what is currently available that is close to what you want to do and try them out. Ask your friends/colleagues to test them also. Pay close attention to the feedback, and especially whether or not it is something they would use frequently enough to want to keep. If you think you have a unique idea, start to proceed… cautiously. Besides the reality that it is costly to create an app, especially since it can cost extra to build for both Android and Apple, the real challenge begins once your app is approved and officially launched. The million dollar question then becomes: How are people going to find out about you? One of the most important financial numbers for a company is the Cost Per Download. This number determines how much advertising money is spent per person that downloads the app. The number in the beginning can be a lot higher than what many people anticipate. Before launching your app, you need to have a marketing strategy in place. Every few months there are stories about a creative app designer who strikes gold by having the latest viral hit and tech world watches as their download numbers skyrocket. This is a terrific example of hard work paying off, and it definitely can for you too, but it is important to prepare for the challenges that you will face in reaching that level of success. The first challenge you need to understand is that it can be very difficult to get people to download your app. Why? There are many roadblocks that can prevent this from happening. It can be surprising to those who work in the tech community, but many people have not ever downloaded an app because they do not know their iTunes password, nor how to reset it. Memory storage is also frequently an issue as many phones get loaded up with photos/videos, etc. to the point that they have zero space available. It is crazy to think, but some people still have the iPhone 3G or one of the original Droids, and have an old version of the iOS or Android firmware that does not support what you need to run your new app. The reason these factors are important to consider is because many times it makes more sense to build your idea into a website that has an excellent interface from a mobile device. It can be much easier to engage with new users by having a link to your site that you can email, text, tweet, post or link to on a blog, etc. that people can easily access than it is to convince them it is worth the effort to find and download an app. It is also much easier and quicker to update and add new features on a website than an app. There is always the opportunity to build an app after you already have an established customer base. However, sometimes you do need to build an app to fully control the user experience and provide unique levels of service that are not available elsewhere. Once you have decided on the best path to proceed, it can be of vital importance to connect with the local tech community in your area and promote your new product. Many times great new ideas or partnering opportunities can come from attendees of networking events like those created by Tech In Motion that can take your business to the next level. Carrot Pass is a new app that uses beacon technology and encourages people to be more active by providing financial incentives for them to do so. We were fortunate enough to have been given the opportunity to present at one of their recent events and the exposure and contacts we made will be incredibly valuable once we are able to expand into the Greater Toronto Area. Whatever your vision is, you can be successful doing it as long as you prepare and plan for the challenges. The potential market is HUGE. People love using their smartphones and are always excited to find a new reason to turn it on. Become a demo company or speaker at a Tech in Motion event in 2016 to get exposure like Carrot Pass! Contact a city organizer near you. Are you ready for your front door to be able to talk to your alarm clock? Prepare yourself, because one of the tech world’s biggest buzzwords is on that route. It has been argued that the term internet of things should be changed to the internet of everything. With the capability to connect your phone, laptop or tablet to all the appliances in your home, your car and even your dog, it’s easy to argue that anything can be connected these days. If you’re looking for a position in IoT or another tech field, check out the job board here. Internet of things or IoT for short, is described as the connection of non-traditional devices such as security systems, thermostats, cars, electronic appliances, lights in households and commercial environments, alarm clocks, dog collars, vending machines and much more. These devices utilize embedded technology to connect with an external environment through the internet. Most IoT devices have sensors that can act as your eyes and ears in your home or business. These sensors can register changes in environment, movement, temperature, amount of light, water pressure – even air quality. Delve deeper into Internet of Things with Industrial IoT: Read “How to Win Big with (I)IoT, Industrial Analytics & Big Data” from Sempercon. IoT is making our lives easier, keeping us connected and increasing productivity. Naturally, this topic is driving several Tech in Motion events across the nation, and even inspiring Tech in Motion stories. On September 17th in Santa Clara, some true innovators in the IoT space will be demonstrating at Tech in Motion’s IoT Demos & Drinks, including one company that took to addressing California’s water crisis. “WaterBit has created a sensor that enables growers to optimize yields as a primary outcome, through soil monitoring and related irrigation control.” This sensor allows growers to prevent over-watering and reserve California’s precious water supply. WaterBit can also be used by homeowners by empowering them with the ability to understand, control and monitor water quality and usage for the entire home (or business). When it comes to having fun with IoT Hurley research has got you covered with their product Droidle. They are tiny fun robots that can be connected to social media. Droidles can also be considered as a learning tool because they teach programming trough your smart phone. They are a great way to introduce children to robotics, engineering and developing software. Tend Insight has your home covered, even when your away! They have created “lifestyle smart home products and apps that deliver awareness and insights through immersive experiences powered by computer vision technology.” They offer live video streaming and cloud recording so you can monitor your home ecosystem from anywhere. FlipFlic, a product designed by Comfee, uses solar power to adjust your blinds to close when the sun is shining through the windows and overheating your home. This helps save on heating and cooling bills, plus you can adjust the settings for you Flipflic by syncing it to your smartphone. Want to demo at one of our events? Contact a Tech in Motion event specialist near you here. We look forward to seeing these demo companies in action. Don’t want to miss out? RSVP for this event on the Tech in Motion Silicon Valley meetup page. This summer, Tech in Motion San Francisco gathered at Geekdom to celebrate the companies that make up a huge part of SF’s tech culture–on demand apps. In SF almost anything can be delivered–from groceries to cookies to in-home massages. Tech in Motion dove head first into the newest and hottest apps that give us instant gratification on a daily basis. Doorman – Doorman promises to make sure you never miss a package delivery again. They’re working to change the frustrating reality of mail delivery and ensure that you get your packages when you’re home and available. They gave out promo codes for delivery at the event and wowed members with their practicality. Doughbies – On demand cookie delivery. Doughbies promises homemade cookies within 20 minutes. They deliver to the SF area and are looking to expand as they grow. The company brought homemade cookies to the event and they were quite a hit! Heal – Heal is bringing back the house call. They deliver doctors to your home for $100 a visit. The best part? They can schedule appointments up until 8PM so you no longer have to miss work for a doctor’s appointment! They handed out coupons for first appointments at the event. LiquidSpace – LiquidSpace is the Airbnb for office spaces. They provide on-demand rental for workspaces and have a wide range in size, price and location. They’re located all over the world and headquartered in the Bay Area. In a community of startups and small companies they impressed the Tech in Motion members by giving them an alternative to coworking spaces. Scoot – Scooter rentals for the Bay Area. Scoot offers instant access to scooters that allow anyone to zip around San Francisco. Each scooter comes with a helmet and classes are offered to teach first timers how to drive their scooter. The highlight of their booth was the full size scooter displayed for members to admire. Shuddle – Shuddle offers an Uber-like service for kids. The company provides background searched drivers to parents to drive their kids to and from activities. Rides are scheduled ahead of time, can be tracked in real time and each driver has prior experience working with kids. Shyp – Shyp is working to make the shipping process easier overall. They will ship anything to any destination. They pick up items and pack and ship them to give a seamless shipping experience. The highlight of their booth was a promo code and exclusive Shyp SF bags. Social Print Studio – Social Print Studio specializes in transforming Instagrams into printed materials. They give instant access to photo books, magnets and more. They make great gifts for the Instagram lover! Their booth had promo codes and colorful photos of cats in space. VetPronto – The on-demand service made for pet owners. VetPronto offers house veterinary appointments for animals of all shapes and sizes. Rather than dragging sick animals into the car, the service is delivered to your house when it is convenient for you. The highlight of their booth was branded doggy bags. Zeel – On-demand massages. Zeel brings hour massages to the home or the office. They do specials at work and home including group sessions and couple massages. They’ve become very popular with the startup scene in SF and even brought a massage table to the event! 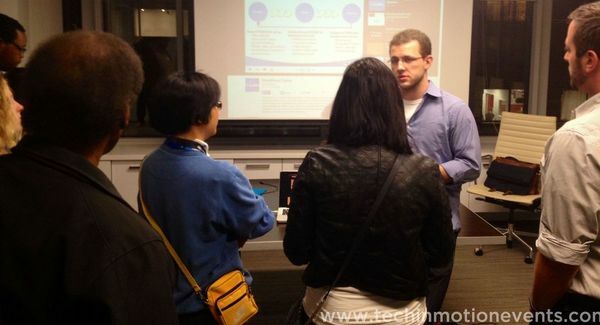 SF Tech in Motion members were impressed with the ten demo companies present at the event. Each app proved to have a different purpose and idea behind them. When a handful of attendees were asked which table was their favorite, the answers were all over the board–every startup was mentioned at least once among the favorites. As the night came to a close, members gathered up the last of the snacks, drinks and freebies. They traded contact info with the other members and left with new apps on their phone – and a renewed appreciation for the on demand culture. Don’t miss San Fran’s next event August 20th: One Giant Tech Mixer. It was a dark and stormy night, but for the June event in Philadelphia, the show still went on to both amuse and bemuse the senses of attendees. Several fantastic demo companies came out despite the stormy weather to display the innovations they are working on in music tech and virtual reality. Local techies came down to City CoHo to experience modernizations such as apples that transmit sound and glasses that can virtually take you to the other end of the world. The high energy group buzzed around the exhibits set up around the room to learn more about what is happening in these industries. Interested in attending a Tech in Motion event? 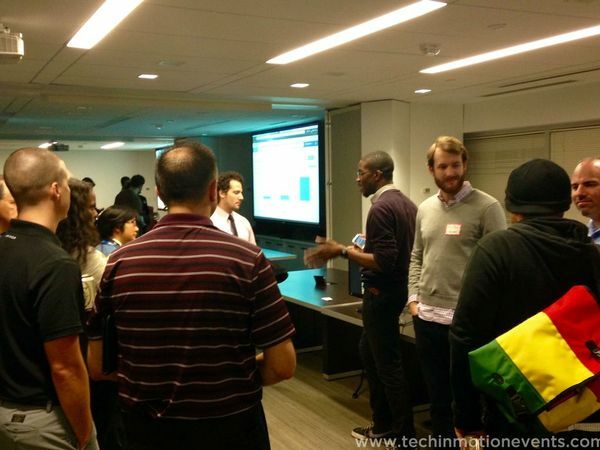 Find a demo, mixer or tech tech on our upcoming events list! Below, Edge of Nostalgia founder presented his app to the audience during the lightning round introductions. Throughout the evening, he showed off how to turn ambient noise into interactive sound and eventually a type of music. Did you ever think you could make music by squeezing apples? Sam Cusumano of Electricity for Progress showed off his BioData Sonification technology doing just that. Using interactive controllers and headphones you can hear sound in real-time – transmitted through the apples. Drexel University’s ExCITe Center came out to show off the research projects being produced in their space by students and beyond. The ExCITe Center specializes in interactive technologies and collaborative projects, with many focused in the music tech space. A local meetup group, VR Philly, got to come out and experience the latest and greatest in the VR field. Local tech enthusiast Scott J. Ross said, “The VR scene is still so small and embryonic, we need events like this to meet collaborators face to face”. It was great to see this community come together with Tech in Motion. Temple University’s BEEP showed off a few innovations developed with their Electroacoustic Ensemble. One local techie said, “I was extremely impressed by the entrepreneurial ambition of tonight’s event. This is what makes the future”. Dr. Adam Vidiksis, who leads this group, has a similar mindset with the goal of increasing technological literacy among its participants and audience. Dj CUTMAN of GameChops provided the tunes for the evening and kept the audience going. He debuted with Tech in Motion at our Gaming Expo last October and we were excited to have him back to hear what was new in the mix. Special thanks to Kurant Cider and Ole Smoky for providing refreshments for the evening. Guests enjoyed the unique flavors of the cider and moonshine samplings. Dan from Ole Smoky got to try out the Google Cardboard our sponsors, Workbridge Associates and Jobspring Partners, brought out. Looking for a job? Check out and apply for one of the positions from Workbridge Associates and Jobspring Partners. This event showcased several local innovations within the musicality and reality space, an often over looked arena in Philadelphia. VR and Music Tech crowd out at events in the future – join Tech in Motion Philly to be a part of the next event! To give you a little background about me, I grew up in India, moved to the US about 9 years back. I went to grad school in Chicago, lived there for about 5 years and then moved to California around 4 years back for work. I have lived in different places but everywhere I have gone, I have met amazing people and made really good friends. Also professionally, I’ve met some really smart people at every company I have worked at. But what I realized was that, as soon as I moved or switched jobs, I was not able to keep in touch with the people there. You know how it is sometimes, out of sight is out of mind. It was my 30th birthday last year. I got lots of calls, texts and Facebook messages from friends and family. I felt guilty that I was no longer in touch with a lot of them; just because we don’t go to the same school or college any more, live in the same city or work at the same company any more. These were all the people that I was really close to at one point but then life happened, we went in different directions and got so consumed in our new lives that we just completely lost touch. I wanted to change that. I started looking for apps that would help me get better at keeping in touch with people but I could not find anything good. I put together a small team and we decided to build one ourselves. The result was Bond. We wanted to build something simple with a great user experience. I had the design and the flow in my head so I quickly built the mock-ups and our developers got to work. We got to mvp in 6 weeks, spent another 6 weeks polishing it up and pushed the product to the app store. I only invited a few friends, family and colleagues to help us test the app in beta. Because we were in the app store, we also started getting some organic traffic. I was also going to a lot of meetups here in LA trying to get the word out about the app. I was getting pretty good feedback from everyone who saw the app. 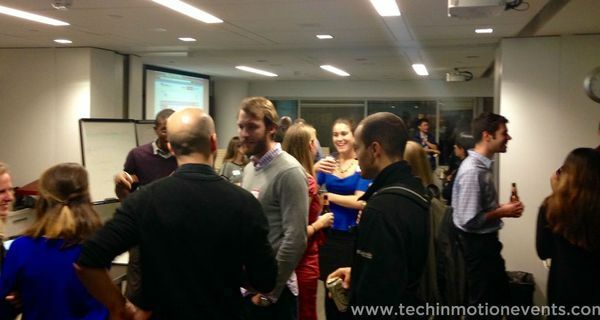 See the lineup of Tech in Motion meetups across the country and RSVP to attend here. Tons of emails with a lot of good feedback, suggestions for features and requests for the Android app. More importantly, these were founders and CEOs of some famous startups, product managers at some top product companies like Apple and Nike, designers, developers and some other tech influencers. These people build amazing products that we use every day- their feedback really mattered. Soon, other tech websites and bloggers from different parts of the world started writing about us. ABC7 News did a piece on us too. Now the word is spreading. Product Hunt gave us an amazing platform to put our product in front of the right audience and it really helped us validate our idea. But there’s a lot of people out there who obviously still don’t know about the app and we want to be able to reach them. So growth is our primary focus right now and at the same time we’re building more ways for people to bond with people in their networks. We’re really excited for everything that’s coming up. To become a Tech in Motion demo company like Bond, contact the organizer in your city. Manan Rokani, Founder of Bond at www.getBond.co, is passionate about building Internet and mobile technology. With more than 7 years of experience working as a tech consultant for Fortune 500 companies as well as an entrepreneur in the start-up environment, he has now founded multiple companies including Bond. Bond is a simple app that reminds you keep in touch with people. There are different ways to keep in touch with different people. The first version of the app had options to keep in touch with people through Call, Text and Facebook, and the new integrates with WhatsApp, LinkedIn and Emails. For each service, simply select the people you wish to keep in touch with and then how often you’d like to contact each one of them. Once set up, the app schedules regular reminders for you. When you get a reminder, just swipe the notification open and you get an option to contact that person right away, leaving no room for procrastination.